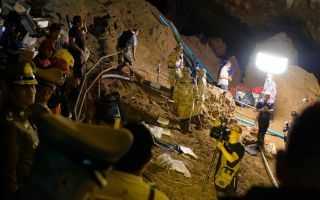 Elon Musk is sending engineers from his SpaceX and The Boring Co. companies to aid in the rescue of a youth soccer team in Thailand that's trapped in a cave and running out of time. "SpaceX & Boring Co engineers headed to Thailand tomorrow to see if we can be helpful to govt. There are probably many complexities that are hard to appreciate without being there in person," Musk wrote via Twitter early this morning. It seems like Musk's aid mission began on Twitter. Twitter user @MabzMagz tweeted at Musk, asking if there were any way the billionaire entrepreneur — who runs the electric-car company Tesla — might be able to help. Musk responded and discussed possible solutions on Twitter with @MabzMagz and entrepreneur @Jamesworldspace. A rescuer worker walks between the hoses which are carrying water out of Tham Luang Nang Non cave on July 5, 2018 in Chiang Rai, Thailand, where rescue crews are working to retrieve 12 boys and their soccer coach after nearly two weeks trapped in a cave. Videos released by the Thai Navy SEAL shows the boys, aged 11 to 16, and their 15-year-old and the challenge now will be to extract the party safely. Neither Musk nor his companies' representatives have yet to disclose any concrete rescue plans. However, "Once we confirm what exactly will be helpful to send or do, we will. We are getting feedback and guidance from the people on the ground in Chiang Rai to determine the best way for us to assist their efforts,” a spokesperson for The Boring Co. told The Verge. So far, over 1,000 people are involved in the rescue of the boys and their coach, as reported by Live Science. Musk hopes that the additional input and help of his engineers will lead to a life-saving solution. So far, Musk has posed a few hypothetical solutions on Twitter, including potentially inserting "a 1m diameter nylon tube (or shorter set of tubes for most difficult sections) through cave network & inflate with air like a bouncy castle. Should create an air tunnel underwater against cave roof & auto-conform to odd shapes like the 70cm hole."